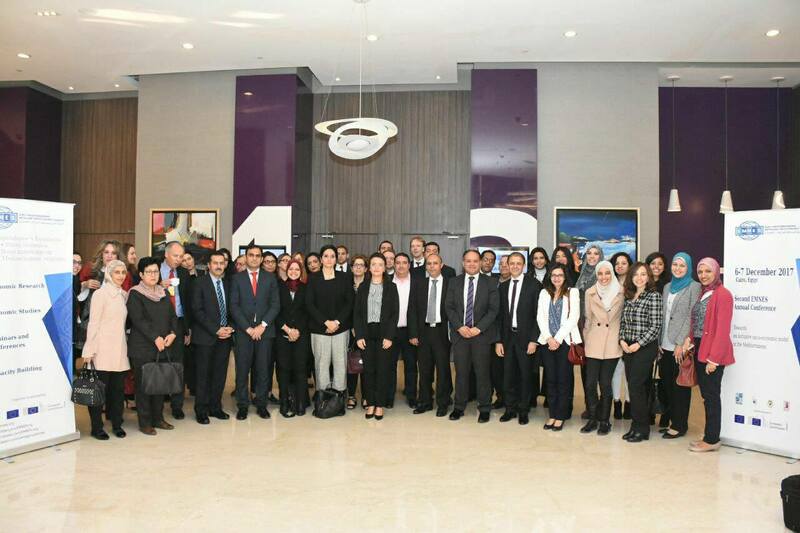 The Euro-Mediterranean Network for Economic Studies (EMNES) second Annual Conference took place in Cairo on 6-7 December 2017 and presented the outputs of the second year of EMNES research. The Conference opened with welcoming addresses from H.E. Hala El-Said, Minister of Planning, Monitoring and Administrative Reform of Egypt, the Vice Dean of Faculty of Economics and Political Science of Cairo University, Mahmoud El Said, and the Scientific Director of EMNES and Founding President of the Euro-Mediterranean Economists Association (EMEA), Rym Ayadi. At the end of the Conference, Prof. Rym Ayadi, presented the EMNES/EMEA Best Paper Award to Aya Elewa, winner of EMNES-EMEA Call for Papers: Towards an inclusive socio-economic model in the Mediterranean. Prof. Rym Ayadi highlighted that it is a core objective of the Euro-Mediterranean Network for Economic Studies (EMNES) to support the younger generation of researchers, yet experts in their fields, to provide policy makers with a renewed vision for socio-economic development in the south Mediterranean countries.